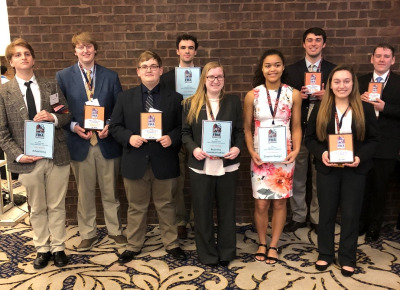 Thursday March 28 through Saturday, March 30, nine HCPS business students and three advisors attended the Future Business Leaders of America (FBLA) State Conference at the Hunt Valley Inn in Hunt Valley, MD. Three Harford County schools participated in this year’s competition and earned the honor of having national contenders who are now eligible to compete at the National FBLA Conference in San Antonio, Texas this June. Maryland FBLA sponsors a Best Raffle Basket competition at the conference each year. Monies earned from the raffle are donated to the March of Dimes, which helps to promote newborn screening and educates the public about the best way to have a healthy pregnancy. Bel Air High School won the honor of Best Basket Design as part of this community service project. Left to Right: Aiden Hoy, Andrew Swallow, Andrew Gerhardt, Nathaniel Hricz, Madden O’Neill, Jazmyne Drakes, Nikhil Wayland, Allie Chaires and Seamus Delaney.